Jan Jaap Minnema at Fraser Yachts contacts me to say that he's signed the central agency for sale of the 39.6m tri-deck motor yacht Ariela. Ariela was built by CRN in 2004 to RINA class. MCA compliant, this superyacht offers accommodation for up to 12 guests in an interior designed by Giovanni Zuccon. Five staterooms consist of a master, two double and two twin cabins along with two Pullman berths and twin 2775hp MTU engines give her a cruising speed of 14 knots. 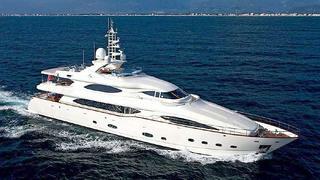 Her asking price is €10.9 million.